Azura Designs is a London-based fashion and lifestyle brand that offers luxury handmade products. With passion for textiles and craftsmanship and a strong commitment to sustainability Azura Designs uses mostly hand dyed and hand-woven fabrics that originate from Central Asia. The character of each fabric is reflected with its unique patterns and bold, vibrant colours which bring out a very individual style for those looking to stand out. Blending traditional fabrics with modern styles, we aim to give our customers a new wearing experience. We hope our beginning evolves to becomes a part of your everyday lifestyle! 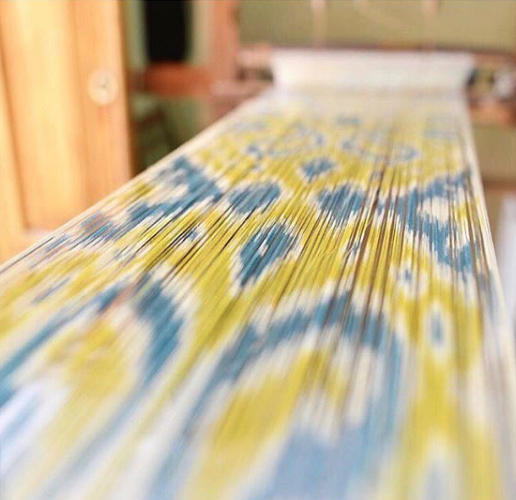 All our fabrics are 100% hand-woven using an indigenous technique called IKAT. It is a remarkable and complex dying technique that has been passed down through generations, which involves bundles of yarns to be dyed together before weaving them. Each of the fabrics are carefully made by skilled hand-loomers in Uzbekistan, some of which take many days to complete the intricate design. We work closely with Kyrgyz and Uzbek artisans who are extremely talented and passionate about their work and in return we pay them a fair, living wage. Working with these locals craftsmen gives opportunities to support them and their families. Our beautiful “Suzani” textiles are hand made by Uzbek women in remote villages of Bukhara region. Each blanket is hand-embroidered by few family members at the same time, giving them the the convenience to work from home as well as looking after their children. Our felt slippers are handcrafted by a small group from the Baytik village in Bishkek, Kyrgyzstan. Most of these women are mothers and grandmothers looking for work to support their families, and our newly set-up workshop provides these women with the training and a source of income.